Last night was a glorious night for hockey in Winnipeg. Yes, the Jets lost in shootout and only picked up one point in the standings. The Los Angeles Kings though lost to the Calgary Flames in regulation time, which means the Jets are going to the big show. The Winnipeg Jets are going to the playoffs, and they may be playing there with the best Winnipeg team to ever play in the NHL. We will show you why after the jump. A team’s performance at even strength is a strong predictor of future success in out-scoring and wins. Using even strength shot metrics even out-performs past even strength out-scoring in predicting future success. It even predicts playoff success reasonably well given the small and variance vulnerable sample size of a best-of-seven-series — although the shot quality 80s lead by Wayne Gretzky saw a slight dip in power. A metric’s success in effectively predicting future outcomes is due to the number lining closer to the team’s true-talent, and the better team tends to win more often. The Jets are a good team this year, and they may be the best team they’ve had. Only once has the Jets been over the “playoff line” which all but guarantees the probability of making the playoffs — sorry Los Angeles Kings. Rarely have the Jets also been above league average as well. The Jets absolute peak performance was a 2pS% of 53.4 in the 1986-87 season, the highest shot differential for that season. The Jets carried a deep squad with Dale Hawerchuk, Paul MacLean, Thomas Steen, Brian Mullen, Dave Ellett, and Randy Carlyle. The team had a rough shooting percentage year, and finished third in the Smythe division. They beat out the higher ranked Calgary Flames in the first round, only to be swept by to the eventual Stanley Cup champions, the Edmonton Oilers. 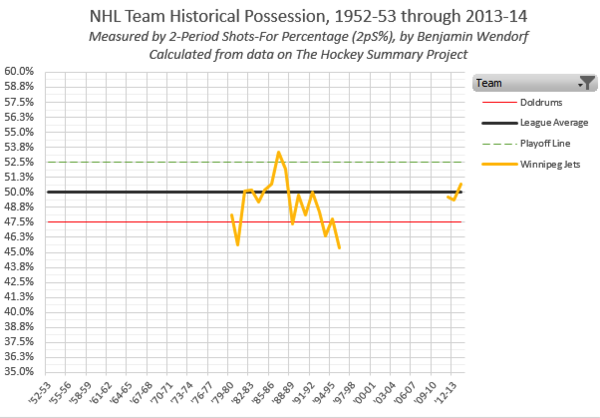 Two-Period Shots-For percentage links closest to Fenwick Close. The Jets currently have the league’s second highest Fenwick Close, at 54.0 percent. Now, we know Score-Adjusted Corsi out-performs Fenwick Close in predicting future wins, but we don’t have that metric prior to the Jets leaving Winnipeg. At no time in this city’s history has the Jets been as dominant in out shooting their opposition in score-close situations. The current Jets are a pretty good team, maybe even the best Jets team ever. Let’s watch and enjoy how they do in the playoffs. Congrats to Jets Nation! It’s great to see teams from Manitoba, Alberta and BC qualify for the playoffs. Thanks for the great work Garret! Just out of curiosity who is #1 in Corsi close?